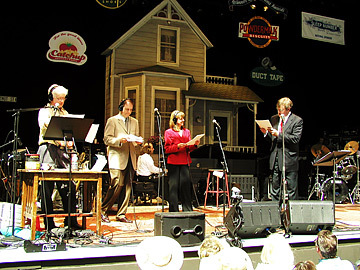 Garrison Keillor, right, and the cast of "A Prairie Home Companion" come to Honolulu Nov. 11. Has it been a quiet week in your hometown? Tell us about it. In advance of the Nov. 11 performances of Garrison Keillor's "A Prairie Home Companion" at the Blaisdell Concert Hall, we invite faithful listeners to submit essays in the mode of Keillor's "News from Lake Wobegon" reports. The difference is, you must set your report in your Hawaii hometown. The prize? From the Star-Bulletin: $100 cash. From Hawaii Public Radio: two tickets to the sold-out 12:45 p.m. live broadcast performance, plus an invitation to the HPR VIP party earlier that day and a gift basket of "Prairie Home" souvenirs. The winning essay will be published in the Star-Bulletin. You must begin with Keillor's classic phrase: "It's been a quiet week in ...., my hometown, out on the edge of ..." and end with his other classic phrase: "That's the news from ..., where the women are strong, the men are good-looking and all the children are above average. Extra points for including localized names from Keillor's stories and for reflecting his storytelling style. Entries will be judged by a panel from the Star-Bulletin and HPR. Send entries to "Prairie Home Competition," Honolulu Star-Bulletin features section, 7 Waterfront Plaza, Suite 210, Honolulu 96813; or e-mail prairiehome@starbulletin.com. No fax entries. Deadline is noon Oct. 30. Be sure to include your full name, telephone number(s) and e-mail address. Employees of the Star-Bulletin, Midweek and Hawaii Public Radio are ineligible. Nonwinning entries may be published without compensation to the writers. Judges' decisions are final. » Gensiro Kawamoto: Outrageous or sincere?